On a sunny afternoon last Wednesday, Nikolas Cruz entered the campus of his former high school in Parkland, Florida and unleashed a fusillade of bullets, slaughtering three adults and fourteen teenagers. In the days since, students at Marjory Stoneman Douglas High School have made their heartbreak public. They’ve gone on camera to call for renewed efforts to reduce gun violence, and they’ve harshly criticized the National Rifle Association, President Donald Trump and Congress for blocking gun control legislation. They’ve also organized the March for Our Lives, a mass rally in Washington, D.C. slated to take place next month. The grieving teenagers have received widespread praise for their impassioned response to the loss of their peers. But they’ve also become a target of conspiracy theorists on the far right. Fringe sites like InfoWars and Gateway Pundit have suggested that the student organizers are fronts for left-wing anti-gun interests, working in collaboration with the mainstream media to undermine Trump. Some of their claims have been endorsed and boosted by higher profile figures like Donald Trump Jr., Bill O’Reilly, and a former Republican congressman. Survivors of past mass shootings have been smeared as crisis actors or media-trained plants. But this is likely the first time allies of the White House are helping with the smearing — and that the targets are publicly pushing back. Most of the attacks have focused on senior David Hogg, a student journalist who recorded interviews with his classmates while the shooting was still underway and they were hiding huddled in a closet. As Hogg later told the press, his father is a retired FBI agent who taught him about weapons — helping him recognize in the moment that the sounds of gunfire he’d heard were real. This link to the FBI was catnip for those who have pointed to the investigation into Russian election meddling to claim that the bureau is a hotbed of anti-Trump sentiment. After the FBI acknowledged Friday that it had failed to investigate a detailed tip about Cruz’s pledge to become a school shooter, supporters of the administration — and Trump himself — said the bureau of 35,000 employees was too distracted by the Russia probe to do its job properly. 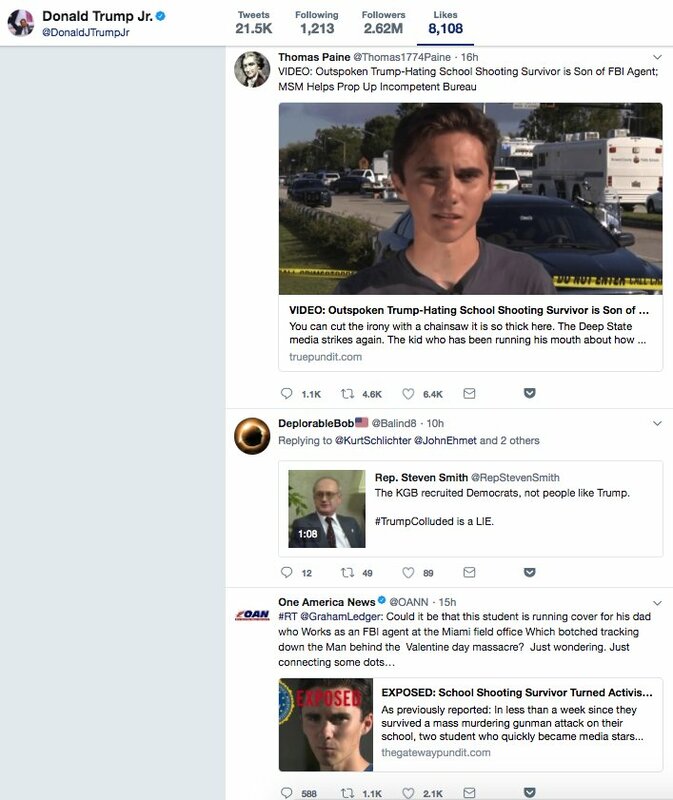 In a Monday post that spread like wildfire on social media, far-right site Gateway Pundit alleged that Hogg was “coached on anti-Trump lies” and a “pawn for anti-Trump rhetoric and anti-gun legislation.” A photo above the post shows the word “exposed” and an FBI badge superimposed over the 17-year-old’s face. The site True Pundit attacked Hogg for “running his mouth” about Trump and blamed him for not informing his father of the threat Cruz posed. An aide to Florida State Rep. Shawn Harrison, a Republican, on Tuesday emailed a Florida reporter claiming that Hogg and another student who had recently been interviewed on CNN were plants. “Both kids in the picture are not students here but actors that travel to various crisis (sic) when they happen,” wrote the aide, Benjamin Kelly. Other conspiracy-based articles have suggested that Hogg was being fed lines, pointing to the ear piece he was wearing during a remote TV interview; that Hogg’s appearance last August in a local CBS News segment in Los Angeles as an eyewitness to an altercation on a beach “raised questions” about his re-emergence in the news now; and that his mother, Rebecca Boldrick, is an “anti-Trump activist” because she shared posts critical of the president on social media. The attacks have come in broader strokes, too. Critics of the student activists speculated that they could not, in the days since the Parkland shooting, have independently organized plans for the national rally against gun violence on March 24. Kingston went further in a Tuesday appearance on CNN, insisting that the teenagers “probably do not have the logistical ability to plan a nationwide rally” and that George Soros or others promoting a “pre-existing anti-gun agenda” were leading the way. But O’Reilly, along with other right-wing figures like The Resurgent’s Erick Erickson, have found a subtler way to undermine the students. They’ve argued that the news media is taking advantage of children still vulnerable from a tragedy who might not fully understand the stances they’re taking. Erickson’s post made a similar point: the survivors of the shooting haven’t “had time to mourn” and were not yet ready to share their stories on national television. The March For Our Lives organizers did not immediately respond to TPM’s request for comment. But some students, like senior Sofie Whitney, have responded to the attacks. And in interviews and on their own social media accounts, Stoneman Douglas’ students have made it clear that they are speaking for themselves.